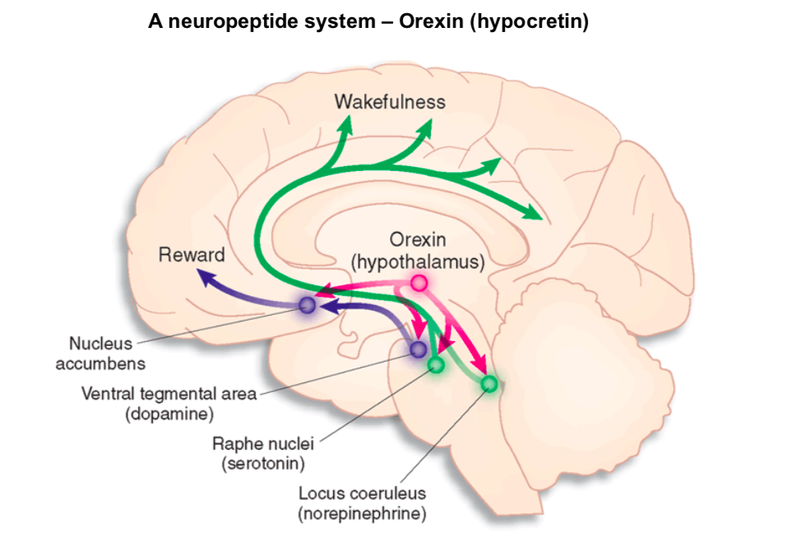 My brain cancer story: Orexin/hypocretic receptor signalling and cancer. Orexin/hypocretic receptor signalling and cancer. Let's consider Orexin/hypocretin receptor signalling and how we may exploit this system for brain cancer management. 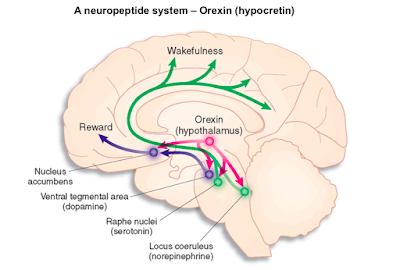 As we can see in the diagrams below, orexin neutrons regulate various activities such as wakefulness, feeding, reward and thermogenesis. A ketogenic diet, normalisation of sleep/wake cycles, fasting, stimulation of thermogenic pathways and giving the brain fuels it thrives on could act as key strategies we can adopt to take advantage of the fact that orexin appears to have potential as a novel, highly-specific treatment for various localised and metastatic cancers. This is not quite as simple as it may sound as you can always have too much of a 'good' stressor or thing before it becomes 'bad'- eustress vs distress. We know of course that fat is a very efficient source of energy for the brain and ketone bodies are neuroprotective, the body energy level influences orexin neuronal activity to coordinate arousal and energy homeostasis. Management of chronic stress is also key as inputs from the lymbic system are important to regulate activity of orexin neutrons to evoke emotional arousal or fear-related responses. Also consider that the brain has an abundance of mitochondria and the matrix water in the presence of cancer either by cause or effect appears to be high deuterium. Normal cells are very good at adapting to changes in levels of deuterium (in terms of reduction) but abnormal cells are not. I have little doubt that Orexin signalling cascades will also be affected by this in a positive way for cancer patients. A lot of this is theory, but it is backed by some sound science. I still have a lot of questions but I think I may have a few interesting theories on this. Hi Andrew, have you checked on Phenylbutyrate? Deuterium experiment part 1- Preparation.